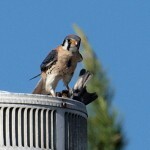 Yesterday afternoon I observed some activity on the chimney of the house across the street. 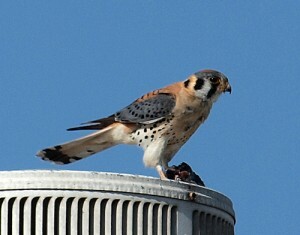 Upon closer observation I noticed a handsome male American Kestrel dining on some prey he had just captured. 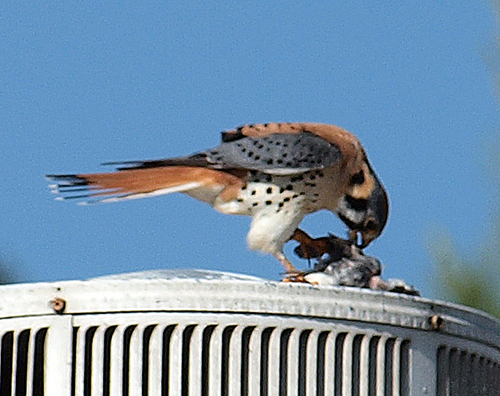 The captured prey turned out to be another bird and the kestrel was wasting no time in consuming his prey. 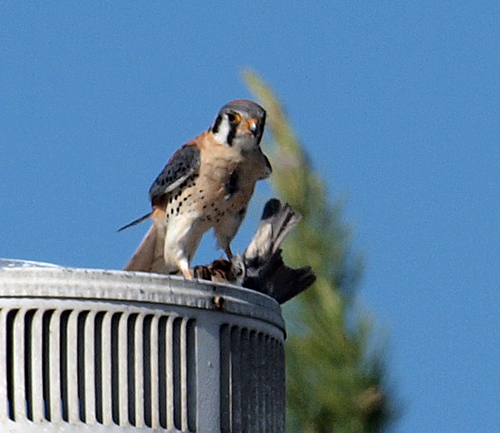 It was difficult to positively identify the prey bird but unfortunately the bird appeared to be a Spotted Towhee. 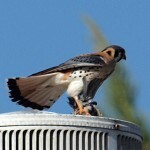 Predator/prey relationships generally have a winner and a loser. 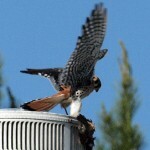 If the predator succeeds – the predator wins! 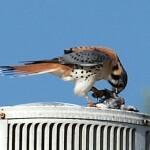 If the prey escapes – the prey wins! Seldom, if ever, is there a win/win situation. The natural world is beautiful, but not neccessarily kind. It’s all about survival. Today we personally experienced a Predator/Prey relationship and like most all Predator/Prey relationships there was a winner and a loser. When I was closing the trunk to the car after grocery shopping yesterday I noticed that the sticker on our PA license indicated that it had expired on 03/2010. I thought that couldn’t be true we purchased the car in late August 2009. We did however transfer Judy’s Handicap plate from her trade-in to the new car. Still believing that the license plate had been updated to the same calendar as our new vehicle purchase, I checked the PA registration – “EXPIRY 03/2010,” it read. We had been driving our vehicle in CA for a month without a valid registration. I had a sinking feeling that I had just become a target Spotted Towhee. I returned home and after unloading the groceries, I immediately went to the computer and “googled,” well actually “binged” (I’m trying it out) the CA DMV. A nice website with all the neccessary information I needed – online forms to fill and print out. That accomplished we settled down for the night and rested for what was about to come. We headed to the Hemet, CA DMV office this morning hoping that it would not take a lot of time to get the problem resolved. After a 30 minute drive we arrived at the DMV office and there were people wrapped around the building waiting to get in to conduct business. With Judy’s handicap we were able to “buck the line” and go right in. We received our number and two hours later our number was called. 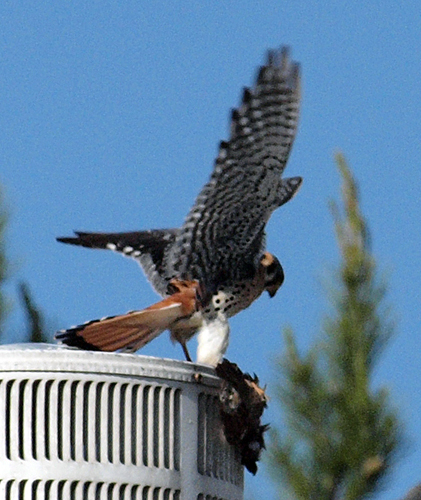 The towhee was now heading directly towards the kestrel. The clerk was very nice and accepted our documentation. 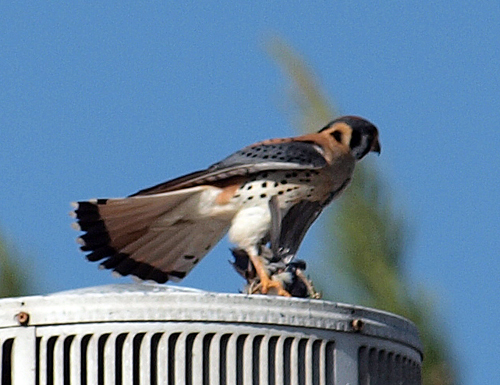 After a considerable amount of time while the clerk, working on behalf of the kestrel, calculated all the figures informed us that State of California (kestrel) would require $802 to register our “out-of-state” vehicle. 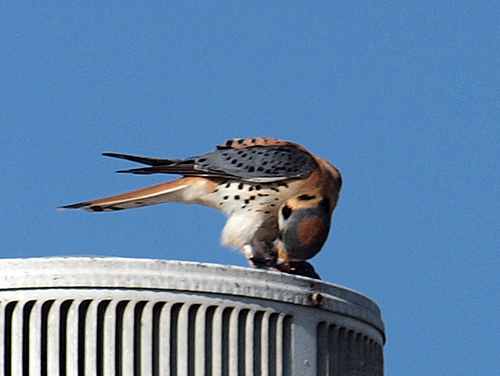 The kestrel was now picking the bones of the towhee and it didn’t feel good at all. 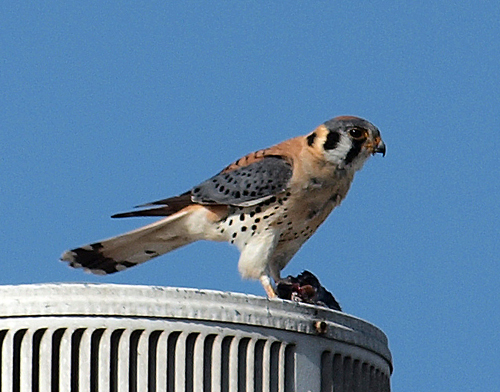 We paid the kestrel and now have a temporary registration but still have to get a SMOG test before they will provide us with a permanent registration and license. The natural world is beautiful, but not neccessarily kind. It’s all about survival – and the State of California continues trying to survive. We feel blessed that we have already had more than $802 worth of sunrises, sunsets, sunshine, rainbows, and new places to explore and visit that have cost us nothing. It all equals out! 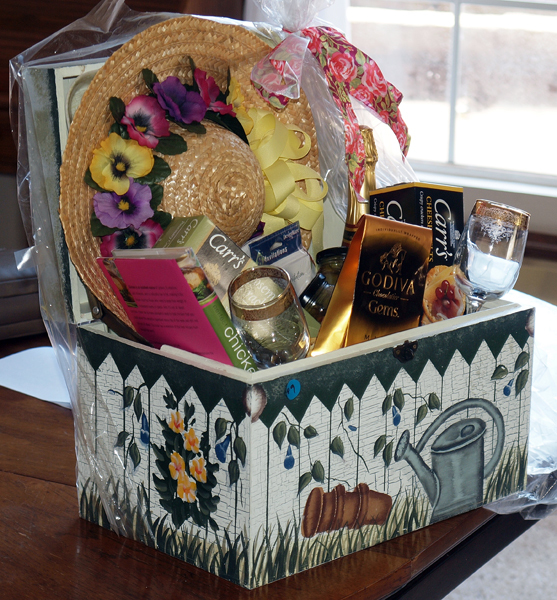 On a positive note, we attended the Temecula Valley Garden Club Flower Show over the weekend and placed some raffle tickets in some of the nice offerings. Yesterday, I received a call that we had won the Picnic Pack. Both of us had forgetten which offering that was but when I picked it up this morning it turned out to be one of the one’s we both wanted. 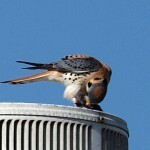 This entry was posted on Monday, May 3rd, 2010 at 7:38 pm	and is filed under General Information. You can follow any responses to this entry through the RSS 2.0 feed. You can leave a response, or trackback from your own site. I have seen a few of the rose tree folks up at the mtn to see golden eagles recently..and it made me wonder how you were doing. So I am checking in! sorry not to have time for extra web blog searching too often. 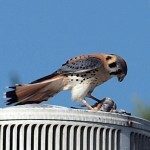 I love the story about the kestrel. 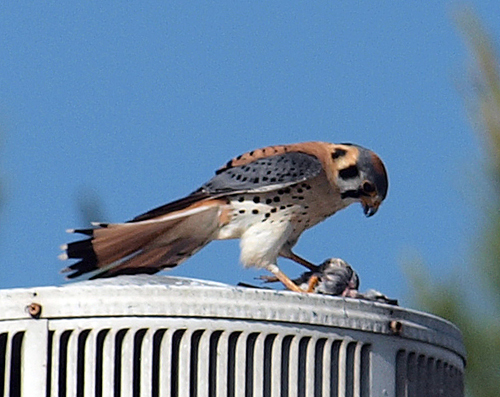 sorry you were the towhee that day. I hope you have caught some migration this fall! happy holidays.